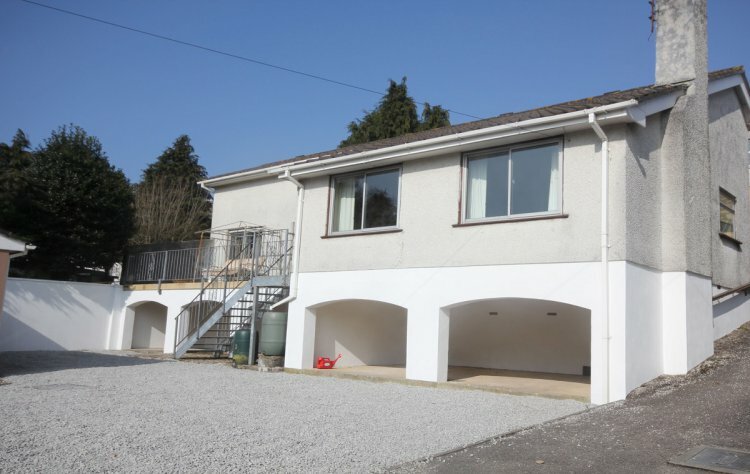 Moresk Court is a recently refurbished raised bungalow, sleeping up to five, just a stones throw from Truro high street and all it's amenities yet tucked away from the hustle and bustle in a position overlooking the garden and with great views of Truro Cathedral. Truro is the perfect location for exploring Cornwall, each coast is easily accessible by car and Falmouth and The Roseland Peninsula are close by. Within Truro itself you're spoilt for choice; there's the Cathedral, Royal Cornwall Museum, Art Galleries, Hall for Cornwall theatre, a cinema and a whole host of fantastic restaurants. You can also take a boat trip on the river, cycle to Trelissick gardens or jump on a bus or train to anywhere in Cornwall. The spacious living and dining room has large windows overlooking the garden. A two seat sofa and three comfy chairs are centred around a flat screen TV with DVD player and there's a log burner too. A sliding door opens to the balcony with steps down to the garden. To one side of the room is a dining table with six chairs. A separate reading room has been created should you like to have some space to read or check on emails; there's a comfy chair, lamp, coffee table, some books and a door to the balcony. The kitchen has been fitted with a 5-hob gas range cooker, fridge/freezer, dishwasher, washing machine and tumble dryer, microwave, kettle and toaster. There is also a breakfast table with two seats and a storage cupboard for the vacuum cleaner and ironing board. The main bedroom has a 5' king-size bed, built-in triple wardrobe with sliding doors, dressing table, bedside tables with lamps and a double sliding door to the balcony, this bedroom has fantastic views of the cathedral. The second bedroom has twin 3' single beds, wardrobe and a bedside table with lamp. In the third bedroom is a 3' single bed, built-in double wardrobe, two chests of drawers and a door to the balcony. The bathroom has a tiled floor, bath with shower over, a toilet, handbasin and heated towel rail. A separate WC also has a toilet and handbasin. Outside of the property there is a garden and the balcony as mentioned above which has a table and 6 chairs with a fantastic view of Truro Cathedral. Please be aware there is a river that runs past the bottom of the garden and although there are plants and scrub there is no solid barrier so please supervise children. A small gravelled parking area is suitable for two short wheel base vehicles, there is slightly restricted access as a tight corner has to be turned to reach the parking area so this is unsuitable for long wheel base vehicles. Living room with 2 seat sofa & 3 chairs, TV, log burner, dining table & 6 chairs. Kitchen with gas range, fridge/freezer, dishwasher, washing machine & tumble dryer. Reading room with comfy chair, lamp, coffee table, books and door to balcony. Bedroom one: king-size bed, triple wardrobe, dressing table, door to balcony. Bedroom two: twin 3' single beds, wardrobe, bedside table & lamp. Bedroom three: 3' single bed, wardrobe, chest of drawers, door to balcony. Bathroom with shower over bath, toilet, wash basin & heated towel rail. WC with toilet & handbasin. Balcony with table & 6 chairs, views across garden to cathedral.